Austrian economic gadfly Peter Schiff once pointed out that of all the names in contention for the position of Chairman of the Federal Reserve, Janet Yellen was clearly the worst. This, in his opinion, made it inevitable that Barack Obama would appoint her to the position. Schiff was right, as he usually is. Here is the rectified chart from AstroDatabank (not much different from the solar chart with the Sun on the Ascendant). It gives us reason to be concerned. Pallas/Ethics: Pallas is conjunct the energy-draining South Node. Pluto (ever the corrupting influence where Pallas is concerned), is sesquiquadrate Pallas and quintile her ruler Jupiter. This chart is extremely comfortable with authoritarianism The only mitigating factors are a weak eight-degree trine between Pallas and the Sun and a sextile between the Sun and Pallas' ruler Jupiter. The "greater good" is very low on the agenda here. 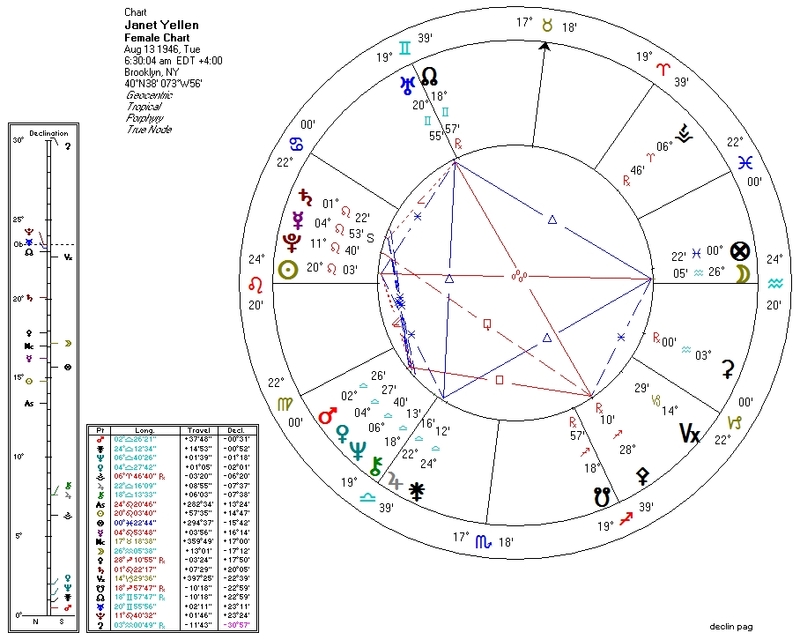 Venus/Second-House/Economics: This is the big one, and it should scare the crap out of any straight-thinking astrologer viewing this chart. Venus (and the Second House) rule money and the perception of value. They are the primary consideration in the chart of any economically-centered entity, especially if that entity is going to be holding the reins of the reserve currency for the entire planet. Venus here is tightly conjunct Neptune, lord of magical thinking and self-undoing -- Neptune is wonderful for spirit but deadly to solid matter. Both in this rectified chart and in the solar chart, this lethal conjunction resides in the Second House of finances. A strong Pallas can override this configuration, but Yellen has an extremely compromised Pallas. To sum it up: almost no ethical/logical capability, absolutely no grasp of economics, and control of the most important currency on the planet. And, yes, there's a Bloodbath Formula here if we notice that Pluto is conjunct the Sun and semisquare Venus. Bad economic policy is deadly, as anyone keeping an eye on the undeveloped world can tell you. On top of this mandala of potential evil is Yellen's North-Node conjunction to Uranus: a predisposition to action without regard to consequences. She shares this conjunction with US Presidents Lincoln, Clinton, Bush II, and Obama: all responsible for approximately a million deaths each.